Members of the European Team at North West Network attended the 8th European Week of Regions and Cities in Brussels in October. The Open Days are an annual event organised by the EUi Committee of the Regions and the European Commission, Directorate-General for Regional Policy. The Open Days are an opportunity for partners from accross Europe to come together to discuss regional policy and promote what is happening in their region. The North West was well represented as always with representatives from all the regional stakeholders. NWN and colleagues from Merseyside Network were there to make sure that the Voluntary and Community Sectors voice was heard, loud and clear. As part of the event NWN staff took their turn staffing the NW of England stand at the Meeting Place exhibition which runs through the four days of the event. In addition to this and attending seminars and workshops NWN and MNE representatives also took part in a rally and march to the European Commission headquarters to present a declaration to the leaders of the European Union demanding a continuation to funds from Europe into the North West. The European Commission in Brussels has started planning Europe’s latest round of European funding, which will run from 2013. The declaration which was presented to European Commission president Jose Manuel Barroso was signed by officials from 220 of Europe’s 271 regions including the North West. 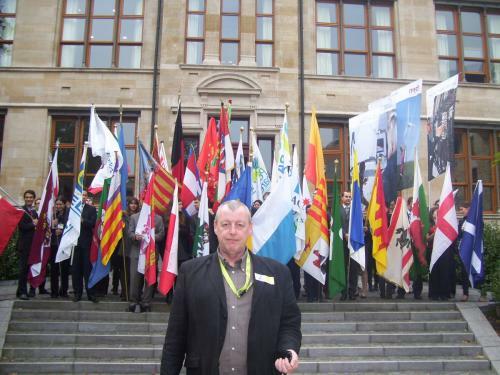 The picture shows John Hacking from NWN in front of a gathering of the regional flags at the start of the march.